The evolution of giant tortoises might not be linked to islands, as has previously been thought. In a first-of-its-kind study, researchers from Argentina and Germany have presented the most comprehensive family tree of extinct and extant tortoises so far. Analysing genetic and osteological data from living species and fossil tortoises, they have revised the evolution of tortoise—their gigantism evolved on multiple occasions on the mainland. The findings will appear in the next issue of Cladistics. Tortoises are a group of terrestrial turtles globally distributed in habitats ranging from deserts to forests, and include species such as the Greek and the Galapagos tortoises. Some species evolved large body sizes with a shell length exceeding one metre, whereas others are no larger than six to eight centimetres. Despite a particular interest from naturalists since the time of Darwin, the evolution of gigantism in tortoises remains enigmatic. The fact that all living giant tortoises are insular may suggest that their evolution followed the so-called island rule: a trend toward dwarfism of large animals and gigantism of small animals on islands. An example of insular dwarfism is the Florida key deer, a dwarf version of the mainland white-tailed deer; its small size may be an adaptation to the limited resources found on the islands. Insular gigantism is best exemplified by the famous dodo, an extinct flightless pigeon from Mauritius, which probably evolved its large body size due to release from predatory pressure. Previous studies on extant tortoises were partly inconclusive—giant size has been linked to the absence of predatory mammals on islands, but researchers have also proposed that tortoises were already giants when they reached the remote archipelagos. Since very few giant tortoise species survive to the present, these hypotheses are impossible to test without analysing extinct species through the help of the fossil record. 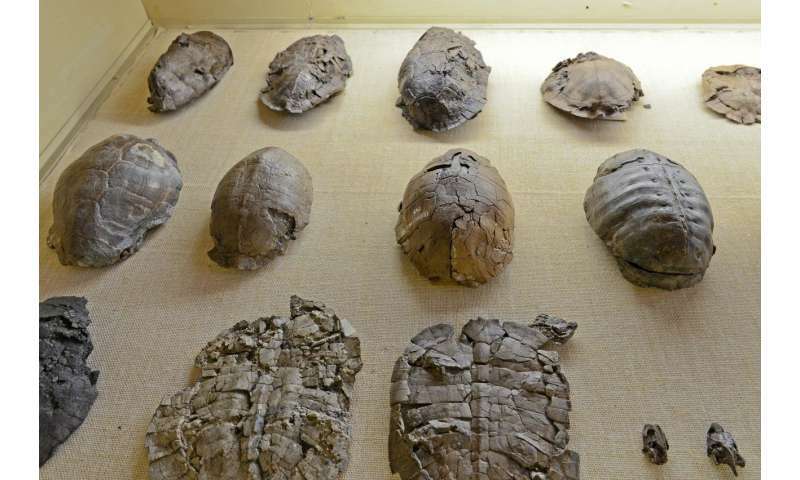 In a recent study in the journal Cladistics, Dr. Evangelos Vlachos from the Paleontological Museum of Trelew, Argentina, and Dr. Márton Rabi from the Martin Luther University Halle-Wittenberg (MLU have assembled the most comprehensive family tree of extinct and extant tortoises so far. The researchers analysed genetic data from living species together with osteological data from fossil and living tortoises. This is the first global-scale study to investigate body size evolution in tortoises. The fossils reveal a very different picture of the past compared to the present. Giant size evolved on multiple occasions independently in mainland Asia, Africa, Europe, and North and South America at different periods of Earth history. However, all of these species went extinct at latest during the Pleistocene ice age. "The fossils highlight a great number of extinct mainland giant species and suggest that the evolution of giant size was not linked to islands," says Dr. Evangelos Vlachos. "Giant tortoises may have been better island colonizers because they can tolerate water and food shortages during an oceanic dispersal for a longer period than smaller species. Giant tortoises have been reported to survive 740 km of floating in the ocean," says Dr. Márton Rabi. What led to the extinction of these mainland giants remains enigmatic. For the ice age species, it may have been a combination of predatory (including human) pressure and climate change. If island insularity is not the driving evolutionary influence, what is driving tortoises to repeatedly develop gigantism? "We expect that warmer climate and predator pressure plays a role in the evolution of giant size, but the picture is complex and our sampling of the fossil record is still limited," Vlachos says. An unexpected outcome of the study was that the Mediterranean tortoises (familiar due to their popularity as pets) actually represent a dwarf lineage, as their ancestors turned out to be considerably larger. "Tortoises have been around for more than 55 million years, and we are now better able to understand the evolution of this successful group. Today, however, out of the approximately 43 living species, 17 are considered endangered, and many more are vulnerable largely due to human-induced habitat loss. This is a disappointing fact," Rabi says.